Whether you work out of an office, a cubicle or a vehicle, the area that you do business from is your command center. This is your personal space that dictates how you perform. 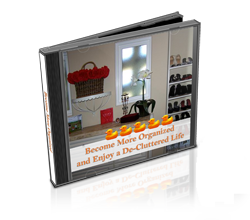 An organized, de-cluttered work environment promotes creativity, productivity, and growth. It allows you to perform at the top of your game. It separates you from the rest. In an environment that is set up for you to be at your best YOU WILL SUCCEED. A daily ‘to-do’ list is very important. This list is crossed off at the end of the day (by hand or virtually), and re-transcribed for the following morning using prioritization. If you must have all of your stuff in front of you, and it doesn’t work if you file it or neatly box it away- this is fine. The same rule applies- you MUST know what is where. When you set us a SYSTEM of any kind, you must maintain it and your staff or coworkers must be aware of it. Most importantly- Everything MUST have a home. Everything MUST be put back in its home after each use. Everyone who is involved in the business MUST know where the home is- and play by the rules. Overall, you will have a much calmer and less chaotic work life if you maintain balance and order. You don’t have to be great at it. You don’t even have to be really good. You DO need to consciously make an attempt and make it a part of your focus. It will make your task more efficient, your job easier, and most importantly, set you apart from the rest.